With BlackLine U Training, getting the most out of BlackLine and becoming an expert is easier than you and your team think. Our Education Services team is committed to empowering your organization with rich training resources that support you on your BlackLine journey. So, whether you’re a new user looking for basic product training or an existing customer looking to hone your knowledge, BlackLine has the right combination of resources to meet your organization’s needs. We created Blackline U - a complete portfolio of education resources – to make knowledge transfer and building expertise both painless and gratifying. And with 98% customer satisfaction, we’re confident that you’ll be delighted with the increase in productivity and proficiency from your team. Whether you’re changing roles within your organization or simply new to BlackLine, we’ve got you covered with comprehensive training resources, so you can begin leveraging BlackLine to be even more effective. From prescribed training, to virtual instructor-led courses facilitated by product and industry experts, to hands-on practice within your own BlackLine training instance, you’ll have the tools and support to achieve productivity rapidly. 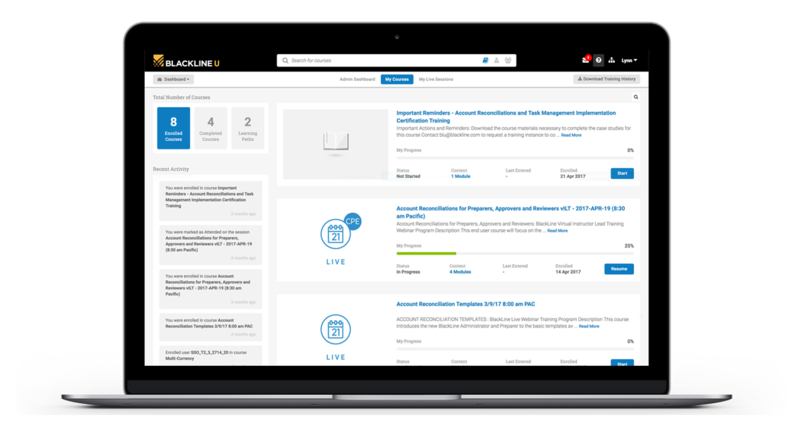 Our BlackLine Learning Paths are designed to deliver structured, consistent, and contextual training that is tailored to your role within BlackLine, whether you’re an accountant, preparer, reviewer, approver, auditor, or manager. And with access to Learning Progress dashboards and reports, managing training activities for yourself or your team is simple. Set up your individual training plan, track your progress, and schedule reports to regularly assess how teams are progressing along their learning pathways. For customers who want to continue honing their skills, BlackLine U Live Webinars offer tips, tricks, and best practices to ensure you are always getting the most out of your BlackLine investment. And as we innovate our technology to meet your evolving needs, our product managers provide New Feature Training, so you stay on top of the new functionality available to you. For those who need CPE credits, we offer curricula that helps you maintain accreditation. And don’t forget to join us at our many customer events such as InTheBlack, where you can connect with our 222,000+ strong community of accounting and finance professionals. In addition to BlackLine U, our BlackLine product experts and expansive partner ecosystem provide global resources with regional, industry, and business process expertise you can rely on. These resources provide training on everything, from using BlackLine to drive operational efficiencies, to leveraging our solution to enable finance automation. With BlackLine, you gain a powerful range of material from our online resources and experts, combined with a broad network of expertise from our partners. With the BlackLine U Learning Portal, training is always within reach. Users have 24 x 7 access to a variety of training resources, including a topic-driven eLearning library for self-paced study and downloadable Quick Reference Guides. You can also register for virtual instructor-led classes through our Training Events Calendar. It’s a powerful combination of resources to ensure you get access to training from wherever you are in the world.